Rex non potest peccare – the doctrine in Roman law that gives the head of state sovereign immunity – is still applicable, in one form or other, even in some countries with republican constitutions, such as France. For four decades it has protected the former president, Jacques Chirac, from prosecution for crimes committed when he was mayor of Paris from 1977 to 1995, i.e., before he became president. On December 15 he was found guilty in two related cases involving nineteen totally or partially fake jobs created for his benefit at the RPR party, which he led as Paris mayor. He was convicted of embezzling public funds, abuse of trust and illegal conflict of interest. Chirac became France’s first former leader to be convicted since Marshal Philippe Pétain, who headed the Nazi collaborationist regime during World War II, in 1945. 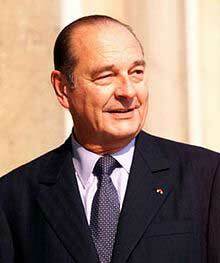 Chirac will not go to prison, but received a two-year suspended sentence. At 79, he is in poor health and suffers from lapses of memory. In a statement hours after the decision, Chirac said that he categorically contested the verdict but would not appeal. Critics hailed the decision as measured and courageous. They said the court showed how political elites and average citizens were equal under the law. Anti-corruption crusaders, long frustrated by dirty dealings in the French political machine, rejoiced. The newspaper Libération wrote the day after the verdict that France desperately needed a debate on the legal status of the president. This entry was posted in Uncategorized and tagged constitutional law, French politics, Jacques Chirac, Marshal Philippe Pétain, power of the sovereign. Bookmark the permalink. I guess the king can’t be a pig, either. It seems to me that the expression is catchy but an inaccurate way of saying, not that the head of state cannot commit an offence, but rather has immunity from any sanction that would be the consequence of the “wrong” doing for anyone else. A foreign ambassador to Canada can park illegally in Ottawa and enjoys diplomatic immunity from prosecution but we would not say that he or she has not done a wrong. One question is whether the head of state (or head of government – Mr Berlusconi hid behind immunity whenever he could, too) is immune from sanctions while he is in office. Bill Clinton spent a lot of time and energy, and money, fighting charges against him while still in office. But the common law sanction of impeachment was really designed to help get rid of a public officer who could not otherwise be prosecuted. Another question is whether the immunity should survive the leaving of office. Mr Chirac’s did not. A third is whether it should apply to actions committed before taking the office that confers the immunity. Chirac’s reign as Mayor of Paris was notorious for its petty corruptions at many levels. The number of his cronies who ended up with very swank desirable and dirt-cheap apartments was legion. The mayor can do wrong, and be prosecuted for it. Now *that’s* an incentive to run for higher office: secure immunity from one’s prior actions. What the French might call a ‘fuite en avant’ (or ‘… en haut’). What is wrong with me? I was puzzled by your initial comment, and now I am puzzled by your second comment. The only “post-editing” that was done was to correct “peccary” (a typo in my blog) to “peccare.” You must have thought peccary was pig Latin. Did you? My spellchecker does not correct pig Latin. No doubt the Kaypro would have done it. A peccary is a kind of American pig (look it up). So I assumed that when you originally wrote peccare, it was “corrected” without your permission by your word-processing program. (Notice that in the previous sentences peccare is underlined and peccary not, which indicates that your spellchecker thinks peccary is a real word and peccare isn’t.) Ergo my puns: pig and pig Latin.